Based mainly on an article in the Maoz Israel newsletter. Wildolive devotes several pages to analysis of areas in which hatred of Israel and the Jews is being propagated. Until now, university campuses have not been covered. Considering how important universities are in the formative years of future leaders and opinion formers, this oversight had to be corrected. You may be setting of to university or sending your children off to university expecting horizons to be broadened and minds expanded by lively exchanges of views and informed debate. Sadly it appears that, where Israel and the Middle East is concerned, lies, propaganda, intimidation and intellectual thuggery are all too common. You may already be aware of the left of centre bias in academic life in general, and a related strongly anti-Israel viewpoints influencing various subjects. But are you aware that Islamic students in universities throughout the free world have been allowed to mount an intense propaganda war to convince the next generation of world leaders that Israel must be destroyed and the land given to the Muslims? From an article by Shira Sorko-Ram in the Maoz Israel newsletter, used with thanks. The onslaught to delegitimize and demonize Israel is coming at an ever quickening intensity. 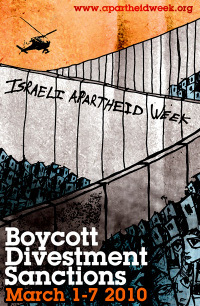 The first two weeks of March witnessed an organized “Israeli Apartheid Week” held in 40 cities across the globe including several cities in the US, Canada and England. March 2010 at Cambridge University, one of the two most prestigious universities in England, Hamas activist, Azim Tamimi, an outspoken supporter of terrorist activity, gave a highly inflammable lecture blasting Israel and her existence in the Middle East, while students quietly took notes. The same month, at Oxford University, second of the two most prestigious universities in England, Israel’s Deputy Foreign Minister Danny Ayalon began his lecture on Israel’s narrative of the Middle East but was constantly interrupted and shouted down with anti-Semitic remarks throughout his speech. 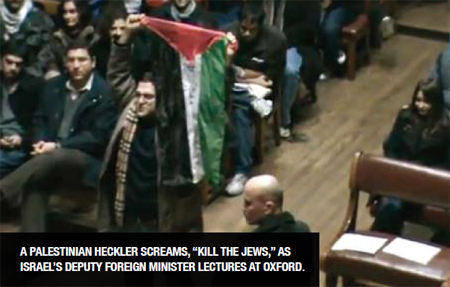 During the event, hosted by Oxford’s student body, Muslim hecklers continually disrupted Ayalon and one protester screamed “Itbah al-Yahud” – “Kill the Jews” as college guards gently moved him towards the exit after giving him time to say everything he had to say - to much applause. The auditorium was stacked with pro-Palestinian protesters who were determined that Ayalon not be heard. Outside the lecture hall, protestors chanted, “From the river to the sea, Palestine will be free,” meaning that Palestine would conquer all of Israel and create its own nation with borders from the Jordan River to the Mediterranean Sea. Finally, after the Palestinians were all removed from the hall, Ayalon was able to give his speech and a number of students thanked him for explaining a point of view they had never heard before! Muslim intellectuals are working ferociously to control what UK university students are allowed to hear from guest lectures. It’s simple: The Palestinian case is the only point of view they want heard. Translation: Palestinians can talk all they want about destroying the State of Israel, but Israelis should have no right to explain the existential threats against the Jewish state, the only democratic country in the Middle East. Tamimi had been invited to speak at Cambridge only days after a talk by Professor Benny Morris from Ben Gurion University in Beersheva was cancelled after the university’s Islamic Society accused Morris of Islamophobia and racism. A few days later, another institution of higher education, Manchester University, notified the Israeli Embassy in London that they would not be able to guarantee the safety of the Israeli deputy ambassador who was to give a speech there. A Facebook protest page organized by “Action Palestine,” a Muslim student society, warned that they would storm the lecture, and the lecture was cancelled. Wednesday 28th April 2010 Pro-Palestinians protesters tried to assault Israel’s deputy Ambassador to Britain, Talya Lador-Fresher, after her lecture at the University of Manchester. The protesters waited outside for Lador-Fresher and charged at her when she left the university event. Security guards quickly escorted the diplomat back inside and then decided to guide her out in a police car. The demonstrators then encircled the police car and climbed on the hood, trying to break the windshield. Eventually, Lador-Fresher was safely removed from the scene. Israeli Ambassador to Britain, Ron Prosor, called the event “lawlessness” with “damaging effects.” He said Israel expects overwhelming denunciation of the violence from local authorities and British universities. But don’t think for a moment that Great Britain’s universities are the only guardians of free speech that are hostile to Israeli guest lecturers. Believe it or not, some of the “hottest” speakers in Universities around the world were far-left Israeli professors from the University of Tel Aviv, Haifa University, and Ben Gurion University. See Israel against Israel. Bring Israel to its knees. Twenty percent of Haifa’s university students are Arabs. Even so, some of them are participating in The Apartheid Week and have sent a letter to the organizers of the movement, applauding the attempts to impose economic sanctions to bring Israel to its knees. Could they write such a letter as citizens in any other Arab Islamic nation? I assure you they could not. Yair Zivan, campaigns officer for the Union of Jewish Students (UJS), said: "The situation on campus is certainly not getting better. The Community Security Trust recorded 59 incidents of anti Semitism on campus in 2007. This year that number will be dramatically exceeded." Evidence of antisemitic incidents on university campuses across North America, Europe, and Australia since 2000 has been recorded by a number of sources. Though the circumstances surrounding the reported incidents are disputed, many maintain that campus activism supportive of the Palestinians and critical of Israel has created an atmosphere of anti-Jewish intimidation that erupts periodically in hate speech and even violence. Laurie Zoloth, former director of Jewish Studies at San Francisco State University, has written of her distress at walking across campus past maps of the Middle East that do not include Israel, and posters equating Zionism with racism and Jews with Nazis, turning the campus into a "Weimar Republic with brownshirts you cannot control." As students form their sense of self at college and seek a niche in the world, some are especially vulnerable to hatemongers who either stir their developing political passions or couch bigotry in academic terms designed to appeal to their intellectual curiosity. Controversial speech is often welcomed at universities more than in other venues; students see their campuses as havens of free expression, with the right to speak near sacred. Racists and demagogues have ably exploited schools' commitment to free speech, cloaking their propaganda in the guise of academic freedom. They have two objectives: hooking the country's future leaders on the ideas they preach, and generating mainstream media coverage through the controversy that inevitably erupts over particularly incendiary events. Among America's students are many who grew up with little or no contact with Jews and who have a limited personal background to fall back upon when professional anti-Semites come to campus. For instance, young adults with little knowledge of the Holocaust might cast an uncritical look at a campus newspaper advertisement or scholarly-looking text claiming to prove that the murder of 6 million Jews is an historical hoax. All too eager to prove their commitment to a free exchange of ideas, many students -- and sadly, school administrators as well -- in their idealism and naiveté, fail to distinguish adequately between debate that enriches and elevates the mind and speech that lowers the level of discourse to name-calling and lies. Many tend to treat all opinions and statements of fact as meriting equal consideration. Crossing the Line: The Intifada Comes to Campus, produced by acclaimed filmmaker Raphael Shore and directed by Wayne Kopping, explores the proliferation of anti-Israel and anti-Semitic incidents on North American college campuses. In particular, the film explores the rapid growth of such incidents following the launch of Operation Cast Lead by Israel’s military into Gaza in late December 2008 and January 2009. The documentary demonstrates the blurring of anti-Israel and anti-Semitic lines, showing how the War evoked deep anti-Jewish sentiments amongst college students and professors. The film explores the context of these hostilities, by demonstrating the financial ties between Middle Eastern Studies departments and Arab states; the often biased and Pro-Palestinian education received by students in college classes; and the historical connection between the Muslim Student Association and the Muslim Brotherhood. Interspersed with accounts from Jewish Students and campus professionals, the film offers a glimpse into the experiences of Jewish college students who are actively involved in the daily struggle of supporting the State of Israel and fighting against biased misinformation both in and out of the classroom. Today's students are facing an anti-Semitism that is different from their fathers or grandfathers generations of quotas and boycotts. Today we find anti-Zionism, Holocaust denial and conspiracy therories to be quite acceptable on may campuses and a guise for Jew hatred. We will examine theses expressions and analyze the messages and materials that are being propagated against the Jewish people. CAMPUS WATCH, a project of the Middle East Forum, reviews and critiques Middle East studies in North America with an aim to improving them. The project mainly addresses five problems: analytical failures, the mixing of politics with scholarship, intolerance of alternative views, apologetics, and the abuse of power over students. Campus Watch fully respects the freedom of speech of those it debates while insisting on its own freedom to comment on their words and deeds. CUFI on Campus' Mission is to provide Christian student leaders with the skills, resources, relationships, and biblical teachings they need in order to speak up on behalf of Israel and the Jewish people at this crucial time. Our Field Organizers travel the country [USA] actively developing student leaders to ensure they have the skills, resources, and guidance they need to speak up on behalf of Israel successfully on their campuses. students.cufi.org - Sadly in USA only. See other forums of Israel Hatred - Who Hates Israel?